Acclaimed British author Pratchett continues to distinguish himself from his colleagues with clever plot lines and genuinely likable characters in this first-rate addition to his long-running Discworld fantasy series (Carpe Jugulum, etc.). This time around, the inhabitants of Discworld's Ankh-Morpork have turned their attentions in the direction of Uberwald--a country rich in valuable minerals and high-quality fat deposits. (The fifth elephant, it seems, left all these when he or she crashed and burned in Uberwald at the beginning of time.) Ankh-Morpork's policeman Sam Vimes has been sent there to represent his people at a coronation--and to find the recently stolen, rock-hard and symbolically important (at least to the Dwarf population) Scone of Stone. As he tells Vimes's story (and surrounding ones), Pratchett cheerfully takes readers on an exuberant tale of mystery and invention, including the efforts of a clique of neo-Nazi werewolves to destabilize Uberwald. Along the way, he skewers everything from monarchy to fascism, as well as communism and capitalism, oil wealth and ethnic identities, Russian plays, immigration, condoms and evangelical Christianity--in short, most everything worth talking about. Not as perfect as Pratchett's Hogfather but in the same class, this novel is a heavyweight of lightness. 200,000 ad/promo; 7-city author tour. (Apr.) 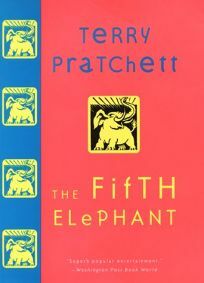 FYI: At the end of The Fifth Elephant is appended a ""handy travel guide"" to the ""World of Terry Pratchett,"" including a character guide to the Discworld novels and a Discworld crossword puzzle.